Bread lines, cold winters, and shining shoes on the corner were part of everyday life for a young boy growing up in the Great Depression. But it wasn t all hard times. The neighborhoods were full of kids, and we made the best of what we had, whether playing football in the sandlot, sliding down a snow-covered hill on a cardboard sled, or hitching a ride on the back of a bus for a dip at the quarry on a hot summer s day. The Second World War brought an end to the Depression, and with it, prosperity for the enterprising youths in my neighborhood. We were a restless bunch, however, and as we came of age, we were looking for new challenges. In 1950, that challenge became the Korean War, and following the death of a friend at the battle of Inchon, we enlisted thirty strong to take on all comers. As an Airman and a cook stationed stateside, my early days in the service were a walk in the park, and the only action I saw was the considerable trouble I made for myself. But I wasn t satisfied, and my search for Shangri-La soon landed me on a remote, rat-infested mountaintop getaway in Korea. There in the filth and squalor, among the rats and lice, with no sanitation or refrigeration facilities, we passed the time playing cards, fending off occasional guerilla attacks, tossing hand grenades, and shooting up the mountain. For all the hard times, what I remember most were the bits of unexpected comic relief that punctuated our misery like the shellacking we took in a snow ball fight with the local villagers; and our trek through rice fields filled with human waste to escape the MPs after a night out with the ladies. Most of all, I remember the stand-up guys who helped me through those grueling 11 months, my snowball buddy Paul, and my best friend Billy Pond. Soon I will join them in the wild blue yonder, where all good airmen go. Kenneth J. Marrin was born in a poor working class neighborhood of Lynn Massachusetts in June 1932 at the height of the Great Depression. After dropping out of school in the ninth grade, he joined the National Guard at the age of 15, only to be released nine months later for being underage. Two years later, while working in the Lynn shoe factories, he and about 30 friends from his neighborhood signed on to fight the Forgotten War in Korea. 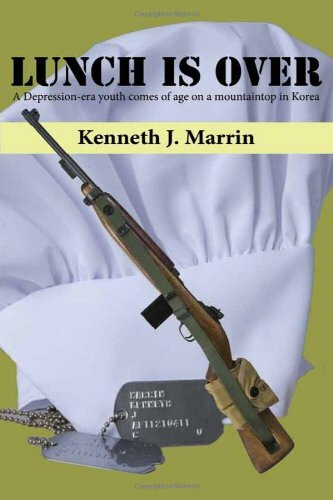 Ken spent three years and three months in the air force, his last year on a filthy, rat-infested Korean mountain top lacking basic refrigeration and sanitation facilities. Following his discharge in December of 1953, he spent the next three years battling tuberculosis, a nearly fatal condition that left him a disabled veteran. Ken went on to earn his GED and graduate from the Salem Commercial School with a business diploma in 1958. From there he entered the civil service, retiring after 30 years in the computer field. Ken is a member of the Veterans of Foreign Wars Post # 507 in Lynn, MA, was post commander from 1993-1994, and marches proudly with his fellow veterans in the Memorial Day parade every May through the streets of Lynn.